His attraction to her is immediate, and he decides to take her back to his Montana Ranch to become his bride. This has been his first foray into the world of infatuation with females. Cherie, on the other hand, has realized her interest in men since she was in her early teens. Her world has been one of hard knocks, and she now has desires of meeting a kindly man who will provide her a “white picket-fence” type of marriage and family — not a headstrong cowboy dragging her to the wilds of rural Montana. Bo is just one in a long line of men who have made their moves with her. His take-charge roughness frightens her. The Kansas City rodeo is over and Bo and his ranch-hand buddy, Virgil, are set to take the bus back to Montana. Cherie thinks she has fled from Bo, but he finds her at the bus depot, and carries her onto the bus, much beyond her desires. The bus hasn’t been on the road very long when the driver is advised to pull off at a local diner, as snows have closed the roads. 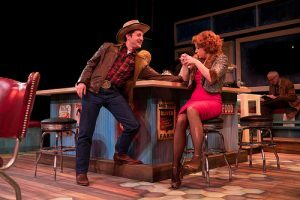 Playwright William Inge has cleverly crafted a delightful situation where the demanding cowboy and the down-on-her luck chorine are forced to come to terms with what they find important. 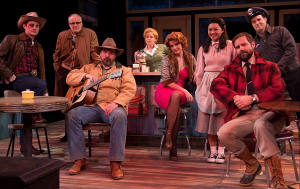 They are surrounded by a wonderful cast – the local diner owner, Grace (Kate Gleason), wanting more to her life than the apartment above the bus stop; Elma Duckworth (Jenna Moll Reyes), the local girl working in the diner, interested in what the world beyond rural Kansas might offer. There is the local sheriff (Geoffrey Kent) who keeps the town in line, and who looks after Grace and Elma while the bus is delayed. Coming off the bus and into the diner along with Cherie and Bo are Virgil Blessing (Michael Morgan), Bo’s right-hand from the ranch, and a mysterious Dr. Gerald Lyman (Sam Gregory) who is increasingly intoxicated state, hallucinating about his past. The bus is driven by Carl (Josh Robinson), whose interest in Grace goes beyond just drinking coffee with her. Each of the performers is very good. They are all part of Arvada Center’s Repertory company this season. The stage set of Grace’s Diner, is excellent. Before the play began, snow was seen falling outside the windows of the diner. Each time the front door opened, a blast of winter air blew in. The audience spends a highly-interesting two hours in the diner, waiting for the road to open, and watching as characters warm up to one another. This is very good comedy, with excellent serious insights into what many are looking for in life. Author William Inge received the Pulitzer Prize for drama in 1953 for “Picnic” – also a tale taking place in rural Kansas. He became respected as the “Playwright of the Midwest.” “Bus Stop” premiered on Broadway in 1955, and a movie adaptation starring Marilyn Monroe and Don Murray was released in l956. Monroe’s portrayal of “Cherie” was one of her early successes in Hollywood. The Broadway production of “Bus Stop” ran for more than a year and was nominated for several awards. The play was respected as a thought-provoking view of America in the mid-fifties, and is a charmer. 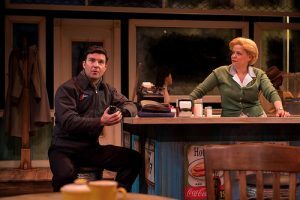 That charm is delightfully obvious in the Arvada production, directed by Allison Watrous, as Cherie and Bo spar — each trying to come to terms with what they are and what they want.